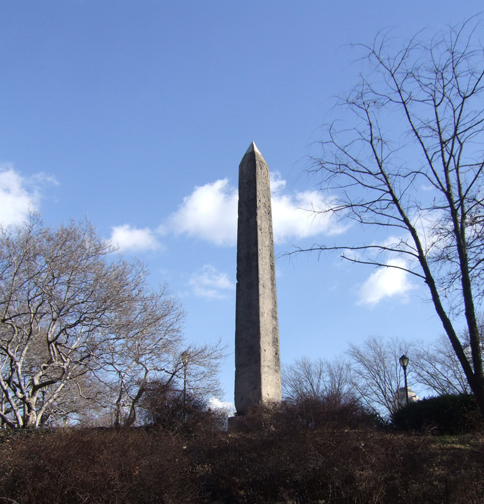 The New York City Parks and Recreation Department recently announced plans to study the effects of the city’s weather on Cleopatra’s Needle, an ancient Egyptian obelisk in Central Park. The red granite monument stood in Egypt’s dry desert climate for more than 3,000 years before being sent to New York as a gift in 1881. The obelisk has been enduring the city’s freeze-thaw cycles and acid rain ever since. As a result, chemical weathering has taken a toll on the Needle’s four stone faces. Many of its hieroglyphics have been worn away. In fact, only two sides are still readable. The west and south faces of the monument seem to be the most weathered, perhaps because the majority of storms arrive in the city from these two directions. Cleopatra’s Needle, in addition to being a wonderful piece of world heritage, is now taking on the role of environmental laboratory. Through the city’s study, we will learn more about the underlying causes and rates of weathering on the stone. This data will, hopefully, inform the plan for the obelisk’s preservation moving forward. This entry was posted in weather and tagged arts, nyc, weathering by Melissa Fleming. Bookmark the permalink.